Recipes: Steak Tartare with an Asian twist and Miso Sea Bass with White Rice and Asparagus | Save. Spend. Splurge. I like to eat but I also like to cook when I think I’m overpaying for something in a restaurant I could easily do at home. Enter: Steak Tartare with an Asian Twist and Miso Sea Bass with white rice and asparagus! If you’re a fan of raw fish, you’ll probably like raw beef too. I’m the kind of girl who likes her steak cooked rare. Very rare. I don’t know what it is, but I just prefer the texture. I like most things raw, even vegetables. Chop the shallots into super fine chunks — the more minced the better, because you don’t want a huge chunk of shallot when you’re eating. Chop the coriander into fine pieces as well. Mince up the tenderloin into small, tiny chunks. You don’t want them too big either. Mix in the seasonings: sesame oil, soy sauce, and pepper. You can also mix in the mustard into the tartare, which is apparently the right way to do it. Chop up the baguette into slices. 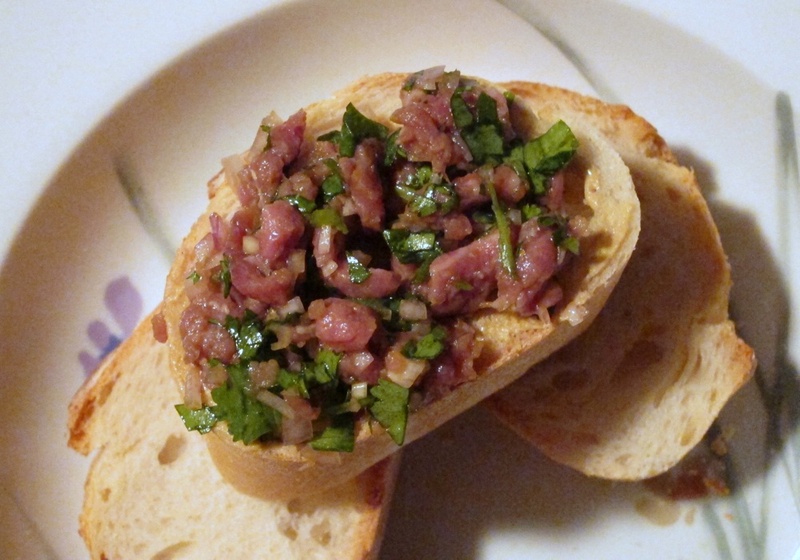 Spread a little mustard on the baguette slices, and top it with the tartare. I know it sounds expensive, and you can probably get it for $13 in some restaurant, but you’d only receive half the amount of the tartare (trust me, I always order this when I see it, and am always hungry afterwards). With the serving portion above, it will be more than enough to eat 2/3 of the baguette (or the whole thing) in one sitting. It will FILL YOU UP!! You can also buy cheaper tenderloin too, if you wanted, which will bring down the cost. Or avoid shopping at Whole Foods, which will be my next move to bring the cost of this down. Sea bass is not cheap, but it is a very tasty fish. You have to marinate the fish for at least 2-6 hours. I mix up the preparation in a bowl and adjust as I go along to what I think would be a good sauce. I mixed it up and then tasted it. I was looking for a salty and sweet balance. Once I found it, I threw the sea bass in there, covered it and let it sit in the fridge for 6 hours. When I was ready to eat, I started the rice cooker with about 2 cups of rice. While the rice was going, I cleaned the asparagus and cut them in half (I got rid of the woody, fibrous ends), and threw them into the oven to roast for about 5 minutes. I took out the asparagus and once the rice was almost done (20 minutes), I put the fish into the oven. Note: I made a slight mistake when I ended up cooking them. I should NOT have put the miso paste on top of them in the oven because it ended up being too strong. I should have just taken the fish out of the marinade and put it in the oven as-is, skin-side up to grill. So that sauce on top that I thought would be good in the picture, ended up being way too strong, and I should have saved it to cover the asparagus or have done something else with them. It took about 6 minutes to cook the 1″ thick fish all the way through (I kept poking it with a wooden spoon to check whether it was firm or still flabby). It is hard to overcook this bass because it is quite oily, so don’t freak out. 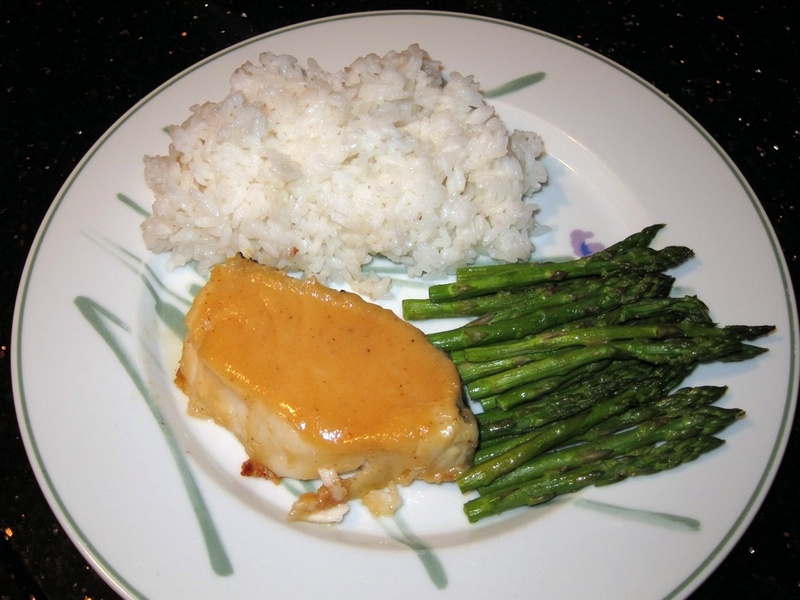 When I took out the fish, I put it on a plate, some rice beside it, some asparagus. Total = $21.25 in total, $5.31 per meal. It was quite cheap, and VERY tasty. Week of Money: Home sweet home..
=O omg. I’m missing out on this!?!?! I could have eaten this when I was in NYC!?!? on a side note… that’s probably the least amount of rice I’ve ever seen you on the plate…. Well that rice was just a starter. I ended up going back for more as I kept eating…. I also love steak super rare. I wish when they ask you at a restaurant if you want “well-done, medium, or rare” you could answer “still mooing” because that’s how I want it. That is usually how I order it but some cuts of beef can’t be eaten so rare – too sinewy or something.